Built for the sports car purist, the Porsche 911 R will reportedly debut at the Geneva motor show in March. Late last year, we first caught wind that the 911 R was all but confirmed for production. Now, Porsche 911 product boss August Achleitner has told Motoring.com that the car will sell in limited numbers. Some reports say that only 600 units will be made, but Porsche has yet to confirm that figure. Last we heard, the 911 R should come equipped with the 911 GT3’s 3.8-liter flat-six engine that produces 475 hp. That engine will pair up with a manual transmission sending power to the rear wheels. The car’s suspension will be GT3 spec, but tuned to accommodate less aggressive aero. 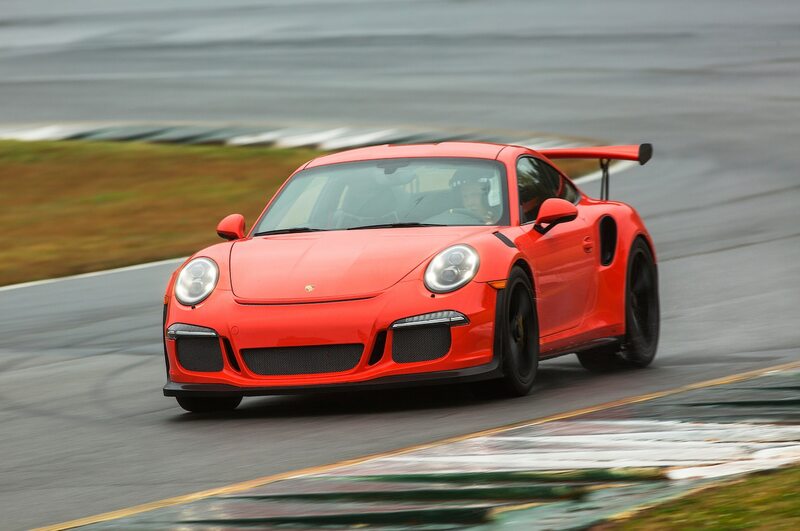 Expect its power-to-weight ratio to match the GT3 RS, says Motoring. Of course, the new model follows up on the first Porsche 911 R that was known for its stripped-out interior and use of lightweight materials like fiberglass and aluminum. The new version should feature a similar “bare-bones” appeal. When we spotted a prototype last year, it looked pretty unassuming without a bold rear wing. Speaking with Motoring.com, Achleitner also noted the 911 R won’t replace the GTS, saying that a 991.2 version of that car is on the way. The post W Hear: Porsche 911 R Coming to Geneva appeared first on Motor Trend. 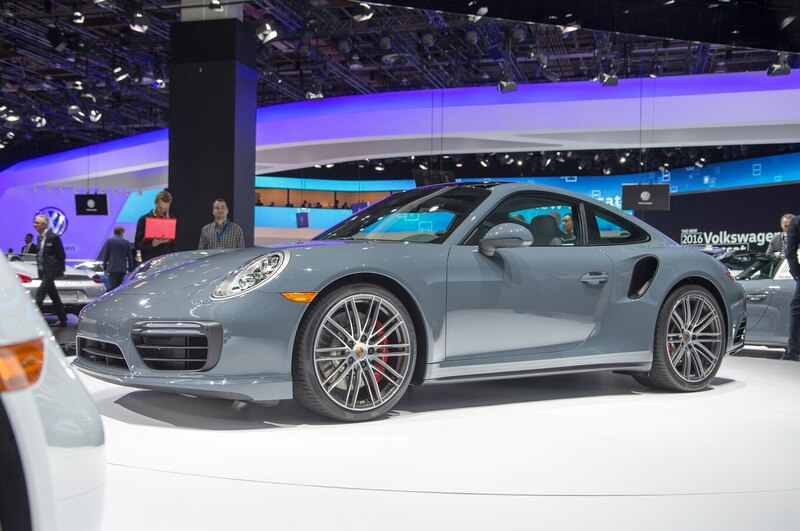 Porsche’s iconic 911 Turbo and Turbo S made their world debut at the 2016 North American International Auto Show with a quick drop of the sheet and review of the business in 2015. Porsche says this additional output propels the Turbo S from 0-62 mph (100 kph) in 2.9-seconds — and claims that this is the first time the cars have been rated under 3 seconds. Of course, we know that this is just Porsche being ultra-conservative; back in 2014, we tested the 911 Turbo S and it hit 60 mph in 2.6 seconds. A follow-up comparison test in 2015 with a different Turbo S yielded 2.7 seconds to 60 mph. We’re guessing the 2016 Turbo S should do it in 2.5 seconds, if not faster. The post Will the 2017 Porsche 911 Turbo S do 0-60 in 2.5 Seconds? Ja, probably appeared first on Motor Trend. 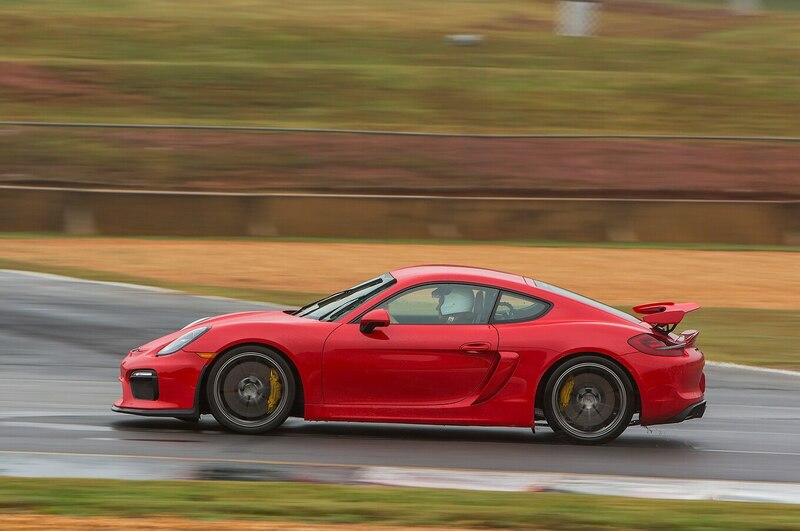 Porsche offered up a test day recently at Road Atlanta, just outside the hometown of Porsche North America, for its two most track-capable street-legal machines. They have a fabulous new facility at the end of a runway at Hartsfield-Jackson. Since the track is only 15 minutes from my home, I was not going to miss it. Of course, I was at a California track the day before, so I red-eyed in just in time for the rain to quit on day three. The track gods smiled on us this time! Lined up on pit lane were 911 GT3RSes in all three colors, four Cayman GT4s, and only two “journalists” other than myself to drive them. Heaven. Both these athletic sprinters have been revised from end to end for lapping road courses, complete with real wings. I am a big fan of downforce. This is the second time I have sampled each of these, and I was inspired to attend by opposite handling characteristics: oversteer and understeer. Too much of either is a problem. And we want that perfect balance, ja? Of course, that varies from one driver to another, and something I admire about Porsches GTs is their tunability. The Cayman GT4 is the upstart with an engineer’s ideal mid-engine placement, a counterpoint to Porsche’s flagship, the classic rear-engine 911. It’s up to 385 horsepower now, a further feeding for a chassis hungry for more. And for the purist it has a driver-intensive manual transmission with one of the best shifters to be found anywhere. When I drove this car at Motor Trend’s annual Best Driver’s Car, it felt really good on the road, but the racetrack revealed a shocking degree of understeer and an annoying level of stability intervention. Our Porsche reps took the car to check alignment. It was a step in the right direction but still uncharacteristic of a Porsche, not to mention a GT. I got so frustrated that I crawled under its gorgeous body and adjusted the anti-roll bars myself: full soft front, full hard rear, textbook to reduce understeer. It certainly helped, but the overriding feel remained a numbing push, hurting the response through the middle of the corners. Among the four GT4s on pit lane was the very car I drove out west. From the first lap, it was clear we were in a new ballpark. The planets were back in alignment, as were the wheels and ride heights. These vaunted GT Porsches have racing coil-over spring/shock assemblies with adjustable perches. They require a genuine track alignment that sets the load on each wheel very precisely. Corner weighting, in competition speak. Apparently, our first car was off-kilter because now the Cayman was back to its old wonderful self. Attacking Road Atlanta in full banzai (wink, wink, Herr Germans) mode was a natural occurrence, the car begging for the whip on its flanks. The wing was an effective aid in the tricky drop into the esses, where cars always get light as the road falls away. The Cayman GT4 also excelled at accel coming off the slower Turn 7 and Turn 10B, helped by the effective Porsche torque vectoring with locking differential. It always put power down well. However, I found I had to be careful braking into Turn 5, which includes a strong transition at the end of the esses, custom-made to destabilize a chassis. Further, in direct back-to-back drives, the Cayman felt slightly underdamped and a bit softer than the GT3RS over the same bumps. These factors were truly minor, and I greatly enjoyed pushing the GT4 like the many race cars I’ve campaigned at this historic Atlanta circuit. Striving for perfection and full speed in every corner is very rewarding in this ultimate Cayman. 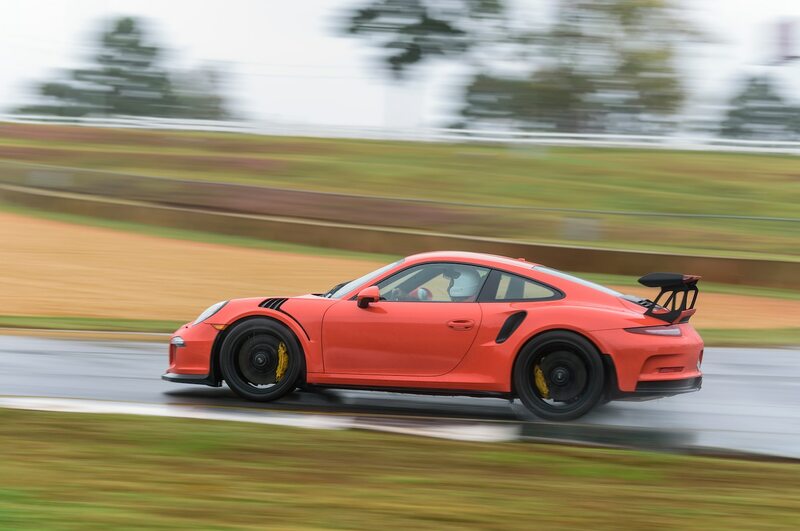 I had the pleasure of testing the GT3RS once before, at the international launch at the torturously entertaining Bilster Berg circuit in Germany a few months ago. I was enthralled by the Porsche engineer’s long description of the track-oriented upgrades for this model. They touched nearly every piece of the standard GT3, and I believe them when they say they enjoyed the process. See the Motor Trend video below and story of that test for more. Leaving pit lane and heading up the very steep incline into Turn 3, I was immediately impressed by the power. It clearly surpasses the GT3, crushes the Cayman, and makes me nostalgic for the almost-gone days of natural aspiration. Five hundred peak hp at 8,250 rpm. Glorious soaring power and soundtrack. Brumos Porsche Racing legendary hosts Hurley Haywood and David Donohue both reassure that the new turbo engines coming are really satisfying, but I say grab one of these while you can. The PDK trans is a joy, but it’s so easy and fast that it definitely reduces driver effort and involvement. Porsche does this better than anyone still. The Cayman’s slick six-speed manual feels antique in comparison but so engaging. Yet pull that gear lever into the wrong slot, Mr. Human Being, and it’s the quickest way to spin, crash, or overrev and destroy that fine flat masterpiece hanging close to the pavement behind you. One slipup will cost you $$$. The PDK eliminates that risk, and it’s faster, and I support Porsche’s decision to equip the RS with it only. I’m rereading the specs, and the technology makes me giddy. Raises my pulse. Rear-steer, dynamic engine mounts, like the PASM shocks, that also magnetically adjust constantly for comfort or performance depending on suspension loads, torque vectoring that uses inside rear braking to improve turn-in. Utterly amazing. And it states right in the factory description that anti-roll bars, camber, and ride height are adjustable for taste. I’m pleased by that because I always seem to find that Porsche track/race cars, unlike most of the automaker’s street efforts, are not perfectly balanced but are delivered with too much oversteer blended in and other surprising handling issues. Perhaps such things are seen as sporty? Fortunately, adjustments can correct or add characteristics more to specific driver tastes. Boutique style. What impressed me the most is the sublime control of the PASM shock damping combined with the dynamic engine mounts. 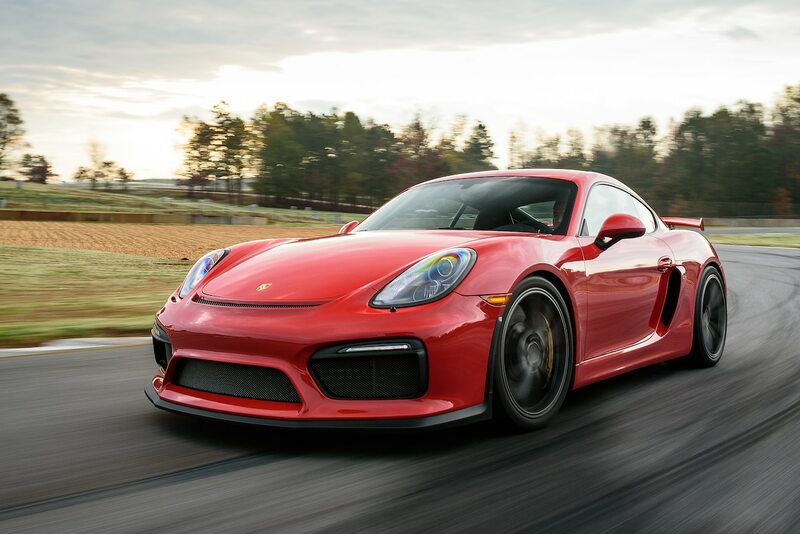 Remarkably refined and better than its little brother, the GT4. This car is so very well tied-down on track yet not harsh on the street, and it eats curbing without disturbing its line on track. Braking is another high point, withstanding relentless corner attacks with a consistent, firm, and linear pedal feel, the world standard on track with no compromise on the street. I’m less than thrilled with this 911’s ability to put its 500 hp to the ground. In second gear, wheelspin-induced oversteer is easily provoked in all-natural form with the stability controls off. I felt this in Germany, too, but not in the GT3. Perhaps this can be improved with a little more front anti-roll bar. I plan to find out. We started the day with a warm-up that quickly turned into hot laps following Donohue. This rousing almost-race put a wide smile on our faces, using these wonderful playthings fully for their intended purpose. For perfection, I still looked for more stability at the limit. For a balance that would make me comfortable driving with reckless abandon, knowing exactly what would happen. The sizable wing was in its level position, so I asked for more, being a devout disciple of downforce. The willing Porsche reps went all the way to max, position three, a visibly significant increase in angle, but it felt as if we’d lost a bit of rear grip. Maybe the middle position offers the maximum effect. We’ll try that later, as well. Up front, we removed the screens from those trick and effective fender vents, and that resulted in a clear increase in front grip, but those went back in because what I really wanted was more stick on the hind end. The whole process of these changes reminded me so much of my career of working with a race team to optimize performance. In sum, we have the ultimate Cayman, now up to nearly 400 horses, and a 911 in street form that can darn near race with the Cup cars. Both are capable of being fine-tuned to the driver’s preference, and both deliver track performance and satisfaction among the very best in the world. The post 2016 Porsche Cayman GT4, 911 GT3 RS Track Review appeared first on Motor Trend. Another month, another parts-bins special from Porsche, this time the Boxster Spyder. But when you have a parts bin like Porsche’s, that’s no bad thing. For instance, the Boxster Spyder’s engine is the naturally aspirated, 3.8-liter flat-six from the 991/1 series 911 Carrera S. The brakes are also lifted from the Carrera S. The steering is from the 911 Turbo, the suspension is the X73 passive damper sport setup available as an option on the Boxster/Cayman GTS, and the optional carbon-fiber bucket seats are lifted straight from the 918 Spyder. Packing 375 hp and a claimed top speed of 180 mph, the new Spyder is the fastest, most powerful Boxster ever. 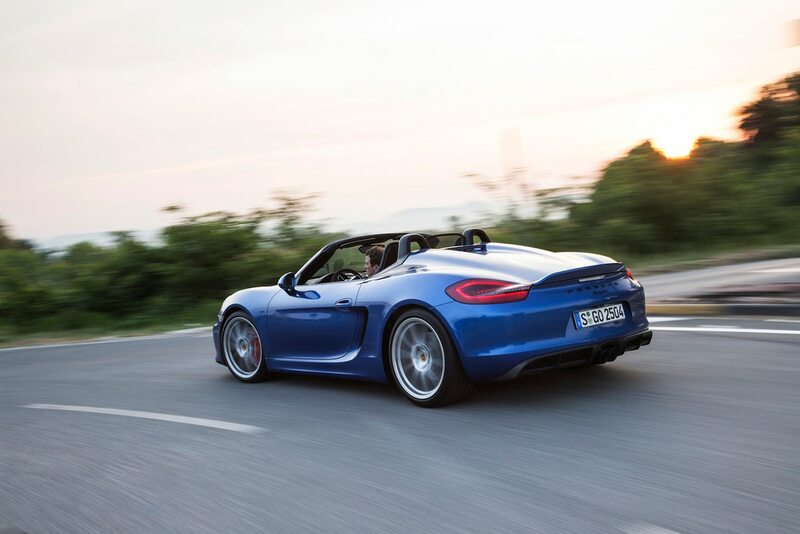 It’s also the last of the line, the last Boxster to be powered by a naturally aspirated, six-cylinder engine. Porsche says all its sports cars other than the GT models—GT3 and GT4—are switching to turbocharged engines, and it has already unveiled the all-turbo 991/2 series 911s. In 2016 both the Boxster and its coupe cousin, the Cayman, will be powered by a new range of turbocharged flat-fours. They’ll also get a name change, to 718 Boxster and 718 Cayman, a nod to the iconic four-cylinder Porsche sports racers of the late 1950s and early 1960s (get the full story HERE). 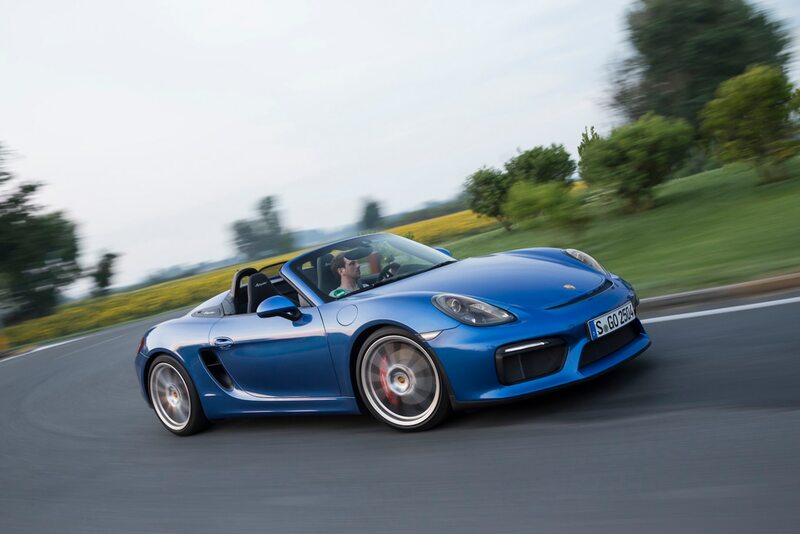 Parts-bin special it may be, but the 2016 Boxster Spyder could also be described as Cayman GT4-lite. It shares its engine, transmission, and front and rear fascias with Porsche’s race-face Cayman. However, it doesn’t get the 911 GT3 front suspension and brakes the Cayman GT4 does, or the strengthened rear suspension components. It rolls on narrower tires, though the 10.5-inch rear wheels are the widest fitted to any Boxster, and the 3.8-liter engine develops 10 hp less than it does in the GT4. None of this matters. The new Boxster Spyder is one of the most desirable open-top Porsches ever. With this car Porsche has gotten rid of the gadgets, stripped out the frills, cut the weight, and left little to come between you and the thrill of driving. 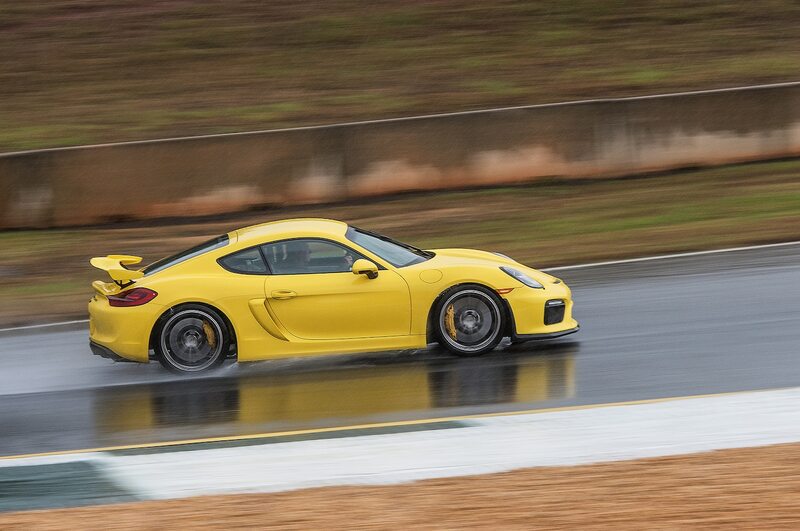 As with the Cayman GT4, the only transmission offered is a six-speed stick shift. To save weight—the Spyder weighs 66 pounds less than a Boxster GTS, says Porsche—soundproofing and insulation have been removed, the standard fuel tank is smaller—14.3 gallons versus 16.9 gallons; the larger tank is a no-cost option—and the regular Boxster soft-top has been replaced with a minimalist, do-it-yourself affair that hides under a large, flimsy aluminum cover with two prominent bubbles—streamliners, in Porsche parlance—stamped into it. There’s no air-conditioning, nor is there a radio. Both, though, are offered as no-cost options: Porsche marketers are shrewd enough to realize that, for all the macho social media chatter, this hair-shirt purist sports car thing can only be taken so far in 21st-century America, especially if you actually want to sell more than a handful of cars. That’s why the options list also includes 18-way adjustable power seats, a high-end Burmester sound system, and a myriad of color and trim choices, including a special paint (GT Silver Metallic, yours for a mere $2,850) and a full leather interior. Throw in a few other choice extras such as those 918 bucket seats ($4,730), the PCCB carbon-ceramic brakes ($7,400) and it’s not hard to get the Boxster Spyder’s sticker to soar from its $82,100 base price to almost $125,000. Plus $995 destination charge, of course. So what’s it like to drive? In a word, delightful. The power delivery from the 3.8-liter engine is superb, a linear surge of thrust from 1,000 rpm all the way to 7,800 rpm, though you might notice a little extra crispness, a little extra clarity to the throttle response once the tach needle swings past 4,750 rpm, where the torque peak of 309 lb-ft plateaus through to 6,000 rpm. There’s no sinister conspiracy in the fact the Spyder’s engine has been tuned to deliver 10 hp less than the identical powerplant in the Cayman GT4. 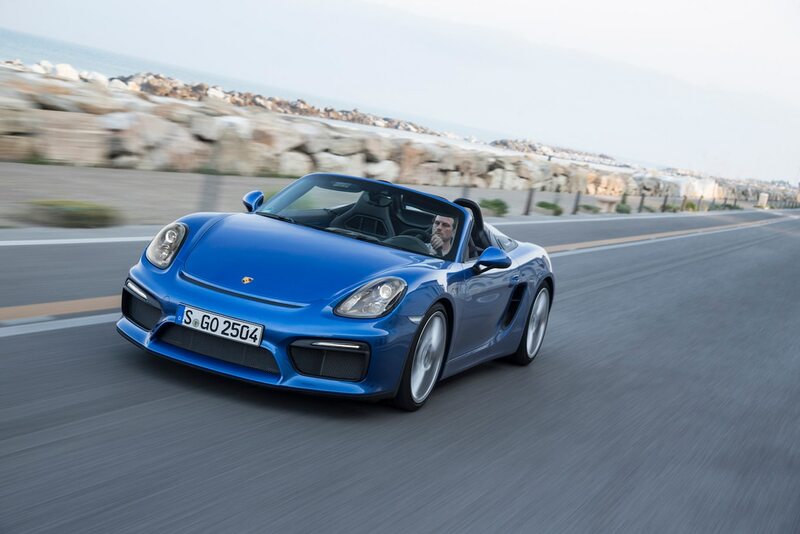 That’s simply the way it’s always been, insist Porsche insiders: A Boxster gets less power than a Cayman. What was that about shrewd marketers? The X73 suspension package is damn near perfect, allowing just the right amount of compliance to avoid overly exciting the Boxster’s impressively rigid body structure on less than perfectly smooth roads while keeping roll, dive, and squat to an absolute minimum. Riding 10mm lower than the PASM system in the Boxster GTS, and 20mm lower than the base Boxster suspension, the X73 gives, when combined with the weight savings, the Spyder the lowest center of gravity of any Boxster. This, combined with the 10 percent quicker steering afforded by the 911 Turbo rack, plus the smaller diameter steering wheel, and the bigger, stickier tires all round, makes the Boxster Spyder feel easily the most alert and agile Porsche roadster this side of a 918. There’s really no need to order Porsche’s optional, near indestructible PCCB carbon-ceramic brakes, as the 911S-sourced steel rotors are more than adequate for the job. Pedal feel is excellent, adding to the delicious sensory feast of the steering and the gearshift and the beautifully balanced chassis and that preternaturally responsive engine. A sensory feast … That’s what makes the Boxster Spyder so desirable, one of those rare cars that’s greater than the sum of its parts. There are many more explosive, expensive, extreme sports cars than the Boxster Spyder, some of which also have Porsche badges. Even its close cousin, the Cayman GT4, is unquestionably quicker, more buttoned-down, more surgically precise, more able to show it a clean pair of heels on the racetrack. But the Boxster Spyder is no less engaging, not the least because with the roof down, and the exhaust switched to Sport mode, you’re bathed in an intoxicating surround-sound replay of that iconic Porsche flat-six snarl, interspersed with a crisp snap-crackle-pop on the overrun. Even when driving down to Starbucks for a latte it’s like you’re on the way to winning the Targa Florio. And that’s exactly how a sports car should make you feel. The post 2016 Porsche Boxster Spyder Second Drive Review appeared first on Motor Trend. Though Porsche is keeping tight-lipped on the details, it’s expected the new flat-fours will share their basic architecture and key components with the new six-cylinder turbos, including direct injection. With the new engines will come a new naming strategy. Both the Boxster and Cayman will receive the numeric designation “718” in addition to their model names, in line with Porsche’s recent move to officially add the 911 numerals to badging on the Carrera, Carrera S, GTS, and Turbo models (and the naming chosen for the 918 Spyder). So, when the turbo-powered 981/2 versions arrive, they’ll be badged 718 Boxster and 718 Cayman. Porsche sources hint the numeric-alpha naming convention will only apply to its sports cars, not the SUVs or sedans, which strongly suggests the forthcoming V-8 powered Panamera coupe developed on VW Group’s front engine MSB architecture will be called…the 928. The post Porsche to Add Flat-Four Engine, 718 Badging to Boxster, Cayman appeared first on Motor Trend.